Watsessing Park is located in Essex County New Jersey which spreads across two towns East Orange and Bloomfield. The Olmstead Brothers (sons of Central Park designer Frederick Law Olmstead) designed the landscape of Watsessing Park. The park is near my home and Fleur, my standard poodle, walks me in Watsessing several times a week. Over the years of walking through the park and waiting for Fleur to smell the roses I found myself examining the trees in the park. I found a variety of different leaves, bark, nuts, flowers and seeds. It surprised me as a woodworking enthusiast how little I knew about defining the types of trees. Each time I passed through the park I would collect a leaf, or a fallen branch and bring it home to investigate the specimen. This is how this obsession started, the obsession of the Trees of Watsessing Park. I decided to map the entire park and catalog each tree to the best of my ability. My first attempt was to make a Google Map of the park, but that became messy very quickly. It is hard to accurately place trees because the graphic map does not accurately match the satellite image, and there is no accurate way to determine a path. Over the course of a few weeks I’d spend an hour walking the park with a handheld GPS creating a waypoint for every tree providing my best guess for the tree type. I loaded the waypoints from the unit to prepare them for map making. Not only are the hundreds more trees than I originally thought, I found it hard to accurately match the waypoints to a map. Because of this I made the decision to map only the section of Watsessing Park which is closest to my home, the northern section. After more than a year of drawing and redrawing maps I’m finally satisfied with something that may make sense to someone. I plan to continuously update and verify this map; if you are able to add information or point out mistakes please share with me. 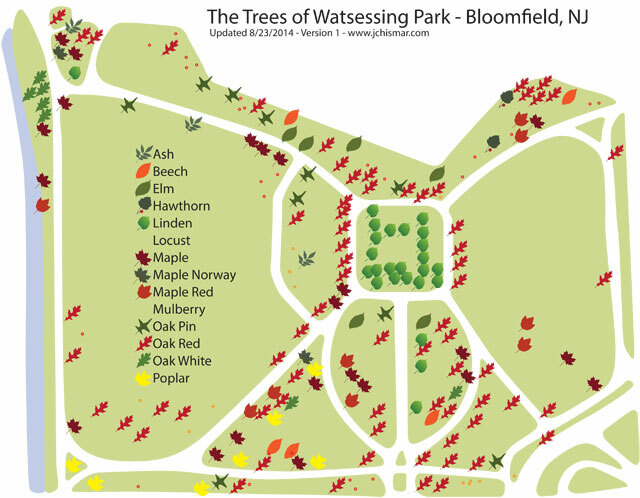 Updates to this map and some behind the scenes will be provided on the Trees of Watsessing page.